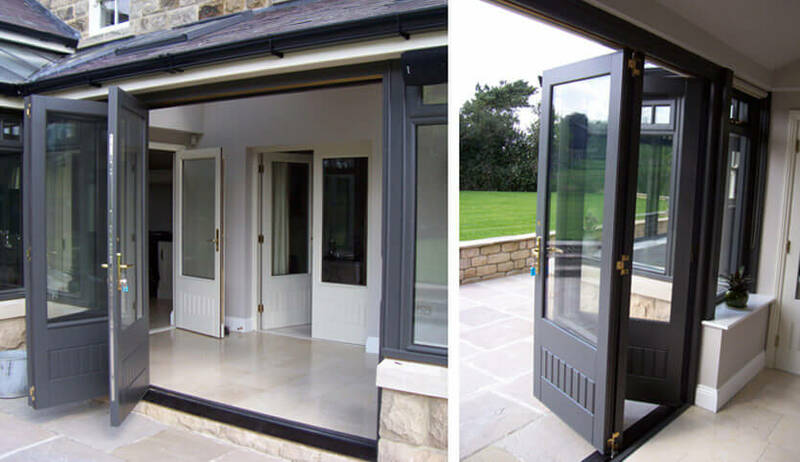 Bi-fold doors are an innovative way of moving between your home and garden. Though they are a modern style, by choosing timber you can create a traditional feel in your home perfect for period properties or to add that feel of days gone by. Wooden doors have been popular for centuries, but timber bi-fold doors combine this classic material with modern design to give a door which seamlessly links your living spaces. With the door panels stacking to one side, you don’t lose any of your space and can enjoy wide ranging views whether open or closed. By creating an open-plan feel between your home and garden, your space will feel larger and becomes the perfect place for entertaining. Why choose timber bi-fold doors? These doors are impressively resilient and can save you money thanks to their impressive energy efficient qualities. Double glazing helps keep the cold air out and warm air in, meaning your money isn’t going to waste by leaking out through your doors. This will help ensure you run an affordable home as well as having a positive impact on the environment. Timber is a beautiful and natural material; our timber only comes from sustainable sources. Refresh your home and garden by creating a new look inside and out. Easy to operate, our bi-fold doors can be used by anybody, but once locked are secure and safe. Available in a wide variety of colours, enhance the back of your home with timber bi-folds. Our doors come in a wide variety of colours to make your home the envy of your street. Choose from traditional timber door colours, or alternatively we can create any colour you desire with our ‘Kolor bond’ system to ensure your new door fits perfectly with your home.